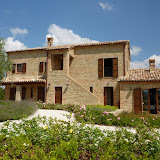 We first came across Le Marche in the summer of 1999, when we stumbled across estate agent Greg Page in his Castellina estate agency Alfa Immobiliare, as we were cruising Chianti country from our holiday base near Florence. Greg's sideline was acting as salesman for Omega, offering fixed price country house restorations in Le Marche, a then little-known region on the Adriatic side of Central Italy. 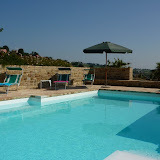 On the spur of the moment - the day of the solar eclipse, which was total in the UK but spookily partial in Italy - we decided we would go and have a look at Le Marche and visit some potential properties. A couple of weeks after returning from our Tuscan holiday, we flew out with Ryanair, arriving in Sarnano around midnight on the last Saturday in August. We spent the Sunday charging from property to property - we saw four or five wrecks and one completed example. That night, we debated the two vital questions: which house did we like, and was the whole thing just an elaborate scam? After a deep intake of breath, we decided to take a chance on the pretty little house nestling a short (though steep) walk below Sant'Angelo. We signed the contract on Monday morning. They promised the project would be complete on 1st August 2000 - just eleven months later. And do you know what? It was. We had a wonderful time at Casa Fontanelle, getting to know Sant'Angelo and the neighbourhood better each time we went out. Italian lessons back at home helped - it's so much easier to make friends if you can at least say hello. The house slowly settled into the landscape, the garden matured, and everything was great. Just a little cramped on a rainy day. As we had fallen in love with Le Marche and Sant'Angelo, we wondered whether it would be possible to spend more time here, and less time commuting up the A14 (the main road from Felixstowe to the Midlands that is, not the A14 autostrada we use every time we fly to Ancona or Pescara). So eventually (in 2003) we decided to look for somewhere bigger. With the help of our friend and geometra Mauro Rieti, we spent an October weekend looking at half a dozen candidates. We saw properties in Penne San Giovanni, and outside Monte San Martino, but we decided we wanted to stay as close as possible to the village we have come to think of as a second home. We were very pleased to find that a wreck we had often admired on the hill road from Sant'Angelo towards Loro Piceno had become available for sale. 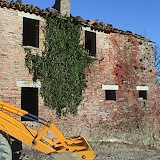 To cut a long story short, we made an offer immediately, and the sale of the land and ruin was completed in March 2004. We always wanted to use the same building team that made such a great job of Casa Fontanelle - so we knew that we would have to wait quite a while until they completed their current projects. We knew that would be at least a year, and probably nearer two - and so it proved. An original start date of midsummer 2005 was put off, but the work finally got under way September 2006 (after a false start in the summer). 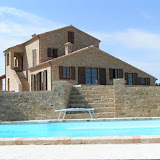 We sold Casa Fontanelle in late 2006 and finally vacated in spring 2007, and the new house was finished by August 2007. The garden came together during 2008 and so now (2013) we have had seven summers with our fabulous new house. 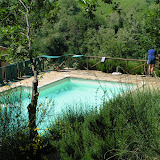 See more pictures of the area at my Picasaweb album home. 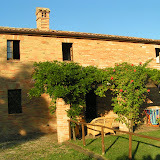 Yes, Case dei due Mori is available for rental whenever we are not in residence. 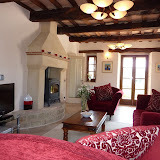 The house sleeps 10-12 people, has its own pool and is very well furnished. You can find more details at our web site or at Owners Direct. We look forward to welcoming you!.